Thank you Pack for a Purpose for all the information you supply on your website. Armed with this information when I returned to Fiji in October 2015, I knew that I could do more. 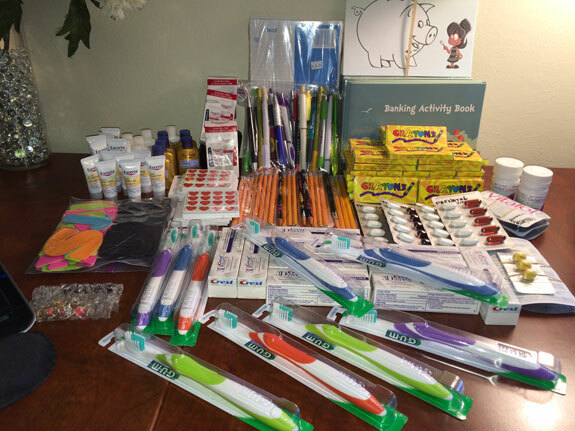 I was able take 13 pounds of supplies; consisting of crayons, coloring books, and school supplies, one soccer ball, a back pack, Halloween pencils, pens, and erasers. For the clinic I took, toothpaste, toothbrushes, skin creams and pre-natal vitamins that were all donated by my personal doctors. The first drop off was to Treasure House Orphanage in Nadi. It houses 27 children ranging from 2 weeks – 17 years old, in a four bedroom house. They received 39 boxes of crayons, coloring books and the soccer ball. I’m sure the little ones loved the crayons and coloring books! My next few donations were for the Yasawa high school in the Yasawa Islands. The high school project is supported by the VOMO Island Resort. There I donated pens and pencils, which I also donated the previous year. The staff handed out the supplies. Next on my list were the projects supported by The Barefoot Collection, Kese village and the Kese Health Centre on Naviti Island. Kese village supports three schools and five villages. The clinic is staffed by only one nurse and helps roughly 500 children and 315 pregnant women each year. That’s one hard working lady! To get these donations to Kese village on Naviti Island, I had to plan to be on the Fiji Princess, 4 day sailing going up to the Yasawa Islands. On day 3, while anchored at Drawaqa Island, Dan Bowling comes on board to share what they are doing to help Fiji in protecting their natural resources. 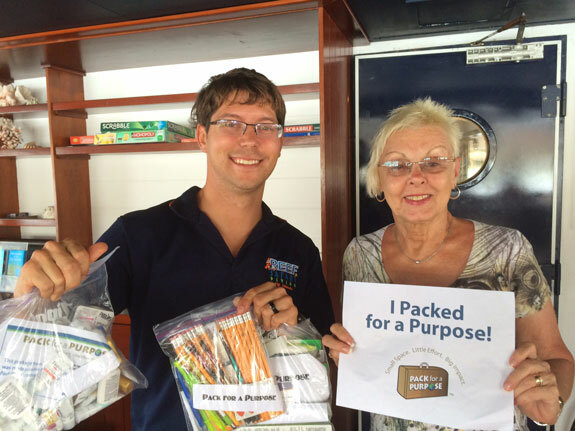 Dan is a local Marine Biologist, Pack for a Purpose “friend” and the Vinaka Fiji Marine Program Coordinator. I asked Dan if he could take the donations to Kese village for me. How else would I have gotten these supplies to Kese? I don’t know! Thank you Dan. It does take a village . . .
VINAKA . . . THANK YOU!